This magnificent, monumental baluster vase has excellent, clear provenance that dates to the 1940s, when it was acquired by an English family in Malacca. Straits vases of this height are rarely encountered now. 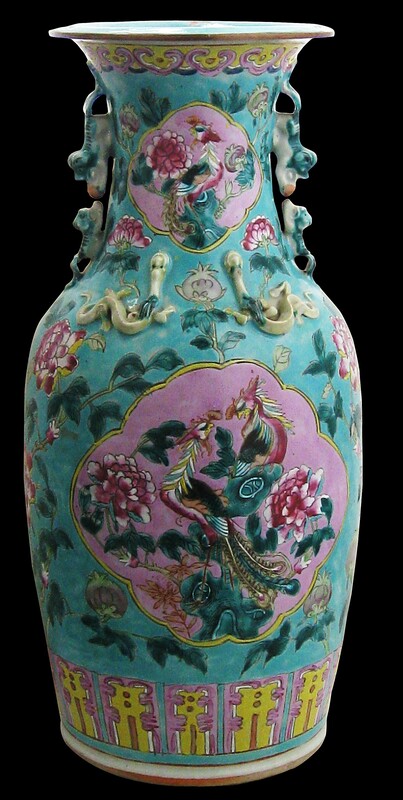 The vase is brightly enamelled with shaped panels containing pairs and a single phoenix amid ornamental rocks and peony blooms against a light pink background, amid a turquoise-green ground decorated with further peony blooms and foliage. The neck and shoulder have moulded pairs of lion-dogs and dragons. Phoenixes and peonies traditionally were associated with nonya brides. 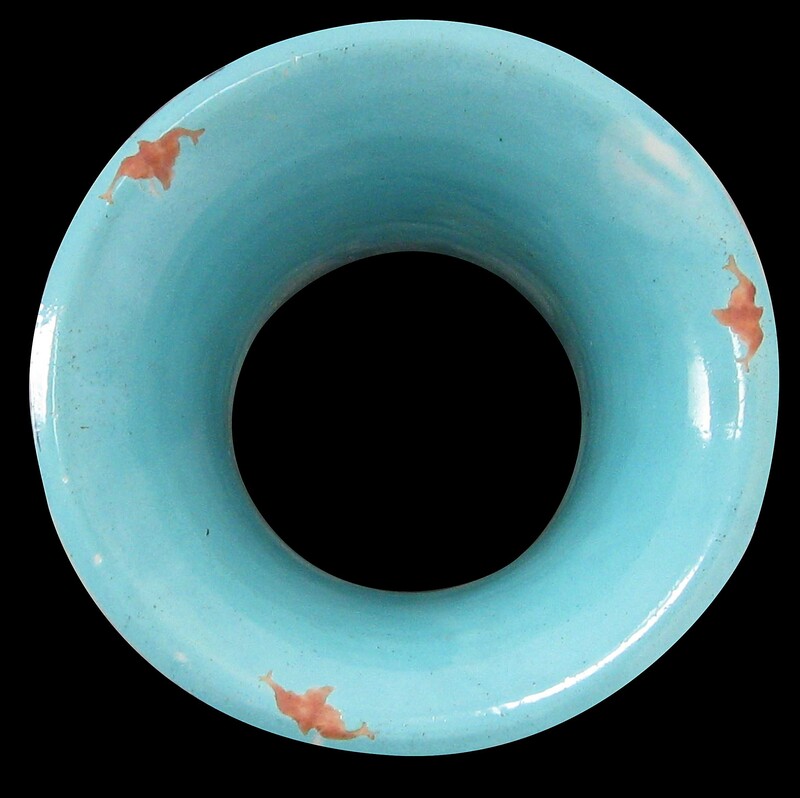 The rim, which has gilt edging, and interior are coated in the turquoise-green glaze, with the inside rim also having three brick-red bat motifs. (The Chinese for ‘red bats’ is ‘hong fu qi tian‘ a homonym for ‘may your good fortune be as great as the universe’). The lower part of the base has a border of stylised lotus petals in the form of brightly coloured orange and coral pink lappets, and the upper part of the neck, just beneath the rim has a scalloped border of yellow lappets within blue and pink borders. The condition of this large vase is superb. No reign, shop or factory mark is present. Vases were not used in the Straits Chinese house to decorate rooms with bunches of cut flowers. Instead, pairs of baluster vases such as the example here were used on the family altar to hold flowers – usually freshly-cut chrysanthemums – meant as offerings to the gods and the spirits of the departed. They were placed on the altar with other religious objects. : Acquired in the UK from an English family from the south-west of England that was involved in managing a rubber plantation near Malacca in the 1940s. A similar vase (although at 43cm high, slightly smaller) was offered by Christie’s Singapore, ‘Straits Chinese Ceramics, Gold & Silver’, March 25, 1995, lot no. 46, (est. S$8,000-10,000). Kee, M.Y.,Peranakan Porcelain: Vibrant Festive Ware of the Straits Chinese, Tuttle Publishing, 2009.